Leader of the pack in secondary placement. Gissler & Pass’s floor displays are guaranteed to present your products in the proper light. 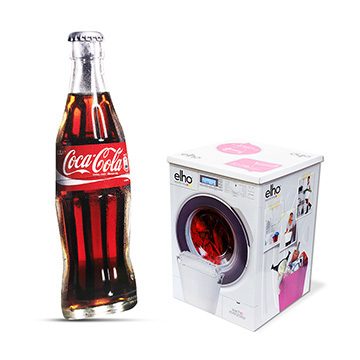 Individual and custom-designed for maximum impact at the POS, they are very effective at eliciting impulse buys. At the same time, there are easily placed and can be enhanced with attractive accessories as desired. Floor displays, or floor stands, are advertising materials for the secondary placement of goods directly at the point of sale (POS). They are suitable for the creative presentation of goods in specialist shops with small placement areas, chemists, petrol stations or pharmacies and are placed directly on the floor with no pallet. Open spaces in the middle of the store, as well as floor space around the edge or near the shelves, are used for this. Thanks to the prominent placement, floor displays draw customers’ attention as a standard or customised solution and tempt them into impulse purchases. Floor displays are particularly suitable for light products and are delivered to retailers loaded or packaged flat. 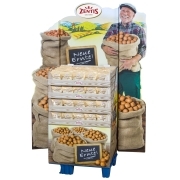 Floor displays in the form of convenience displays are frequently already stocked with goods and allow for rapid and easy installation in specialist shops. What are floor displays suitable for? for product and brand launches: Present your goods excitingly and in an experience-oriented manner. for seasonal goods: Make consumers aware of current seasonal products. for marketing campaigns: Allow customers to interact with your brand with promotions, prize draws and competitions. for sales: Get rid of goods which you don’t want to carry in your product range in the long term. Floor displays are available in a wide range of designs, from simple to elaborate. Environmentally friendly models made from corrugated board are a good choice for shorter term advertising campaigns: they can be set up quickly and can be disposed of and recycled just as quickly once the advertising campaign is over. Want to reach a young, technology-conscious audience? You can also equip your floor display with touchpads, monitors and/or lighting. These elements enhance your brand and product presentation. The multimedia character also invites customers to interact. Most customers only make their purchasing decision at the point of sale. A study by Germany’s largest market research institute, GfK, comes to this conclusion. Even if your brand or your product was unknown until now: you can make your voice heard with floor displays. Striking top signs with a stamped contour and a creative design anchor your message in the consumer’s mind and direct attention to the products on offer. provide orientation for consumers in the jungle of products. offer customers a wide variety of ways to interact with your brand. inspire customers to make impulse purchases. communicate your brand’s message and values. The design of our floor displays is optimised for rapid sales. GISSLER & PASS knows what manufacturers of branded goods and retailers want. We implement display concepts which promise success for you. Do you have a particular idea or a special request? Talk to us! We always welcome a challenge! Our company is characterised by quality, flexibility and creativity. Unusual project ideas spur us on! Competence and many years of experience. Display solutions perfectly tailored to your requirements and what your customers want. Reliability and a traditionally dependable service. An atmosphere or family and partnership. To us, you are not a number. Individual: Our floor displays are customised / tailor-made. We implement your specific desires and stage your brand promises appropriately for the POS. Innovative: Special products demand special solutions. We develop entirely new floor displays, innovative and functional, for you or optimise existing floor displays using little tweaks with big effects. Efficient: At GISSLER & PASS, one hand knows what the other is doing. You benefit from an efficient team who pursue one goal: implementing your project promptly and optimally. Our portfolio of standard designs also offers you quick and efficient project implementation. Flexible: We work at various production sites and distinguish ourselves with high-performance logistics. This flexibility means that we are able to rapidly realise and deliver your floor display. Complete: With GISSLER & PASS, you get everything in one place, from the concept through digital design of your floor display in 3D, through production of the white sample to series production and, upon request, through to complete loading with goods (co-packing). we provide you with our pooled experience, creativity and flexibility. 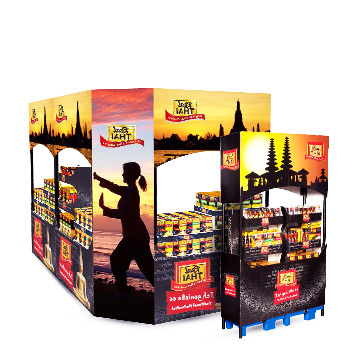 we effectively bring your products to the fore in floor displays. the GISSLER & PASS team develops a perfect display solution for you. we are at your side as a partner throughout the process. only one thing matters to us: your satisfaction. We put your commercial success at the centre of our efforts. Because we know what matters. I’m planning to commission a floor display. How does the ordering process work at GISSLER & PASS? Briefing: We clarify your requirements and wishes in a comprehensive discussion. Design and digital prototype: See your floor display come to life on the computer. White sample prototype and testing processes: Examine the prototype of your floor display in a relaxed atmosphere before final manufacturing. What items do you want to display on a floor display? How do you want to present your brand world? What target audience do you want to reach? What is your concrete goal? Do you have specific wishes and requirements with regard to the display? What material do you want for your display? After the briefing discussion, we develop a tailor-made floor display for you digitally using the latest CAD software. You see the desired result in 3D first. We then create a white sample. This is a prototype of the later floor display series. A GISSLER & PASS sales representative presents the advertising medium to you in person. The floor display then undergoes various tests. In addition to stability, our most important testing criteria are practicability, quality and ease of transport. Displays which will carry goods are loaded with original goods upon request and undergo trial shipping. We can thus be sure that your floor display meets the day to day requirements. Where does GISSLER & PASS produce the floor displays? The displays are produced at our company sites in Jülich and Rodenberg. What types of floor displays does GISSLER & PASS manufacture? You can get both custom floor displays and standard solutions from us. The possibilities are virtually endless in terms of shapes: We produce column shaped, round, square or elliptical floor displays for you. we equip tiers with an environmentally friendly pusher system. Are you considering a stand display in the shape of the product as a particular highlight? We are happy to supplement your standard display with promotional material such as columns, posters, stand-up displays. One benefit is the extensive advertising space which optimally presents your brand message. What types of products are floor displays suitable for? What material does GISSLER & PASS use for the floor displays? We use corrugated board as the base material for our floor displays. Your wishes, needs and requirements are paramount for the choice of supplementary materials. Lavish presentation underlines the exclusivity of your product or your brand. How long until my floor display is ready? Before the beginning of production, we give you an approximate estimate of the lead time. Unfortunately we cannot make any sweeping statements on this point. Each one of our floor displays is a unique item. We manufacture it according to your specifications and tailor it perfectly to your requirements and wishes: high quality, exceptional and focused on your brand message. With GISSLER & PASS, each floor display is a custom piece. Even standard versions are tailored for you. The product, goal and target market differ from project to project. We create a goods carrier for you which is perfectly tailored to you and your needs. Tailor-made: your display is unique. It is optimised for your wishes, needs and requirements. 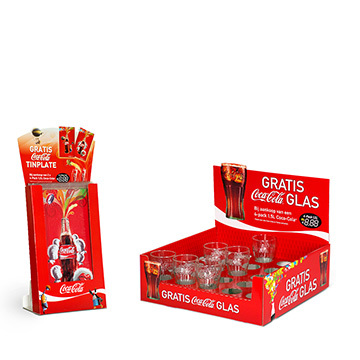 Perfectly staged: your brand and products stand out at the point of sale thanks to unique presentation. 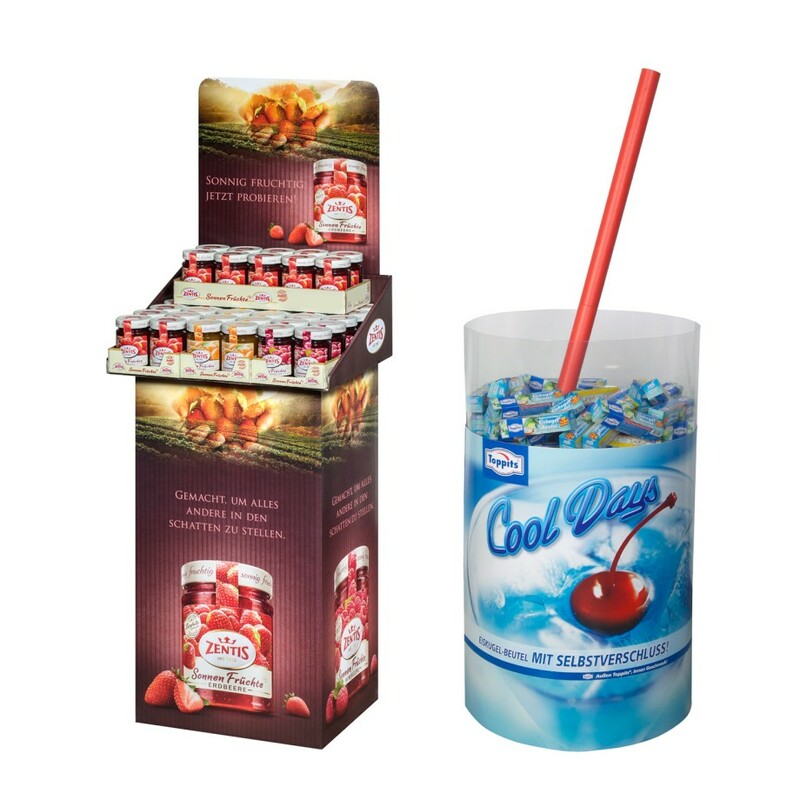 Successful: our creative floor display solutions facilitate impulse purchases by customers. This contributes to an increase in your sales. Individual: you are unique at the POS. No other company has the same display solution as you. What are “modular display systems”? Modular display systems work like a construction kit: Basic elements such as the base, display shell or chutes are suitable for various products and brands. These elements are individualised with posters, stick-on labels and attachments, and adapted to suit your product or brand.